I love reusable bags. I’m crunchy and proud, so I like showing off my upcycling skills as well as my environmental concern. Reusable bags have so many uses. I use them for grocery shopping (obviously), but I also use them as beach bags, toy organizers, craft supply storage and even to grow potatoes in. The possibilities are endless. 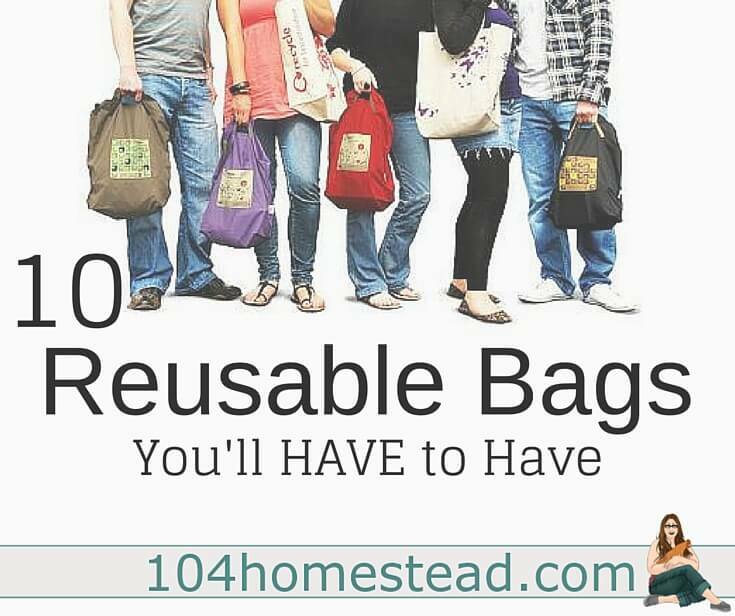 You can go to almost any major retailer to purchase reusable bags. Many of them offer some great recycled plastic and oil cloth options. I have a super cute owl one from T.J. Maxx that I take to the beach and a support teachers bag from Hannaford that I use when I chaperon at school events. I have also made many of my own. As being crunchy gains popularity, more and more people are coming up with creative ways to go green. Here are some great reusable bag tutorials for your crafting pleasure. Smashed Peas & Carrots offers a great tutorial that is so quick you can make 20 in an hour. These bags are simple mesh netting/tulle so that you can see the produce stickers inside. This one is perfect for those tees you love, but they just don’t fit anymore. Ideas de Manualidades may be in Spanish, but the pictures will walk you through this tee-shirt bag tutorial. These produce bags by Awaiting Ada only require a fat quarter of fabric. If you sew enough to know what a fat quarter is, these bags will be a piece of cake for you. I’m not going to lie. These babies take a while to make, but they are so worth it. Plarn is made from weaving plastic bags. I made a bunch for myself and before I knew it, people were commissioning me to make some for them. Here’s a great tutorial from Julie Schneider on making plarn as well as the bag itself. The braided handles on this tee-shirt bag by One Good Thing by Jillee had me worried. I loved the look, but feared the handles would cut into my shoulder. I was wrong! It’s nicely padded and one of my go-to bags. I’ll be honest. I’m not an advocate of drinking Capri Suns, but even I have to admit, this bag is super cool. Check out how to make it by visiting A Few Shortcuts. If you have livestock, you’ve got feed bags coming out your ears. I use them for bringing recyclables to the transfer station, but I’ve also made a few of these bags by It’s Growing On Me. They aren’t too challenging to make and they hold up amazingly well. They are perfect for heavy items. This is my favorite bag of all time. I don’t use this style too much for groceries, but I use it as a quick casual purse or to bring books to and from the library. These are easy to make and sometimes I live on the edge and mix-and-match my pillow case triangles. Check out the tutorial at I Can’t Find the Time. These fabulous oil cloth snack bags from Brit + Co. are easy to make and help keep baggies out of the landfills. The colors are great. I found similar fabrics on Amazon. Oil Cloth Snack Bags by Brit + Co. These bags by How Does She? are not only cute, but they unfold to make a teeny little place-mat to enjoy your snack on. How adorable is that?! Folded Snack Bags by How Does She? For more reusable lunch containers (as well as some healthy lunch ideas), check out my post The Natural Lunchbox. So be Crunchy Cool and make a few of these awesome bags. If you’re looking for more homemade bag ideas (or maybe you’re unsure of your sewing abilities), I love the Craftsy online classes. They offer a Learn to Sew: Simple Bags class as well as more advanced classes like Quilt-As-You-Go: Patchwork Bags, Elegant Machine Embroidered Bags, and Zip It Up: Easy Techniques for Zippered Bags. And if it’s your garden bounty you need to haul around, check out this easy-sew harvest apron. Great post! I use a shopping bag made from a large cat food bag. I had to black out the UPC code though, because it kept ringing up as a sale! You always do interesting posts. Love this.